"Ibara" integral with green canvas Micarta, W1 steel, mosaic pins. Hi! Thanks for stopping by. Some of the most fun I have making knives is when I work closely with a customer and we come up with something that really pleases us both- a collaboration of sorts. This may range anywhere from you seeing a knife you like in my gallery, then asking me "but can we just use green instead of brown Micarta for the grip?" to you drawing a design and sending it to me, and me working from that if I think that it's something I'd feel good about making. 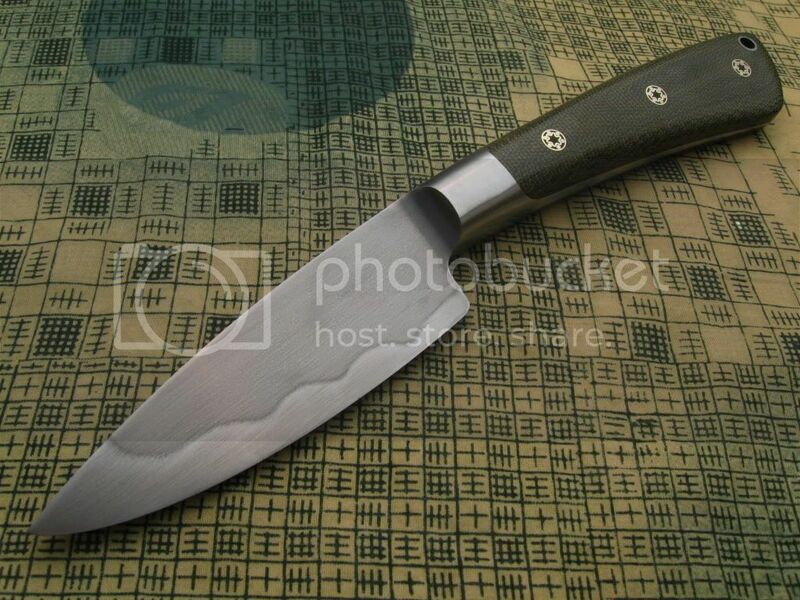 The base price for a knife generally includes shipping anywhere in the U.S. with a sheath. This base price extends to any of the steel, non-exotic handle materials, and fasteners I have on hand. My base prices will be based on an estimation of total material cost, including shop expendables and power/fuel, the amount of time I spend making the knife, and shipping. A good place to start is to determine what the basic knife will look like. Will it be a copy of somethig you have seen here? Or perhaps an altered copy? If not, we'll establish what the knife will be used for, or if it will merely sit in a collection. Depending on the use and desired style, we'll pick things like the grind, steel type, handle construction and materials, and furniture style and material. Once we've put together a basic knife, I can go ahead and build that, or we can discuss options for making the package a little more fancy. It's all about what you want in a knife and my skill and experience, such as they are, guiding the project and bringing it to life. Or inanimacy. Whatever. W1. Great pure carbon steel for vivid hamon. Holds a very good edge at medium flexibility. 5160. The original steel for several of my knife models. Yes, I still have some of that GT Mustang coil spring stock if that matters. Takes a plain “quench line” and is a very flexible, shock resistant steel. Hold a pretty good edge. 52100. The performance king of the lot. Very fine grained chromium bearing steel. I forge this myself out of large rock crusher roller bearings. I do not offer it with a “temper line,” as this is precluded by my heat treatment methods for this type of steel. I triple quench, and triple temper this steel, then draw the spine softer with a torch. Superior edge holding and flexibility. I work with other carbon and stainless blade steels and we can talk about it if you want to use some other alloy. Cable or layered Damascus also available on request. Micarta in two types, ivory paper and brown canvas. Wood in many types- all unstabilized. Cocobolo, the one of the lot that really never needs to be stabilized. Curly Koa, a fairly hard and stable wood with beautiful grain and chatoyance. Mexican ironwood, straight but pretty grain, light in color, very hard. Purpleheart, a naturally purple tropical hardwood. Paduak, a naturally orange colored tropical hardwood. Zebrawood, a light/dark striped African hardwood. Bloodwood, a naturally bright vermillion colored hardwood. Jatoba, or Brazilian cherry, a straight grained reddish hardwood. Ipe, from Indonesia, straight grain, very hard, a bit like mahogany with color more like walnut. Curly maple. Domestic hardwood (from Washington state) with curly grain. If you would like me to use any type of Micarta or G10 that I do not have in hand, the price of the overall knife generally will increase by $10. Most synthetics fall into this price range for one knife. Some will be a bit more. Bi-colored or twill-textured synthetics, custom or glow Micarta/G10, and carbon fiber are generally more expensive; added cost depends on market price and shipping expense. I can get whatever kind of exotic stabilized wood you may want- generally I ask for a deposit in the amount of the material and shipping in this case. Feel free to shop around on the net for some if you like. We can find a specific piece and order it if you wish. For blades with bolsters I currently have brass or stainless steel on hand. I can get nickel silver in the necessary stock size at an added cost. For knives with a guard I currently have brass or nickel silver. I can obtain stainless in the necessary stock size at an added cost as well. Any of the original fasteners on a pictured knife falls into the base price for that knife. I could alternately use Corbys or other types of mosaic pins or fasteners; added cost depends on market price and shipping expense. I have some fossil ivories on hand, mostly in what I would call “folding knife sizes,” not really big enough to handle fixed blades with. With a deposit I could obtain larger pieces if you wish. The basic sheath I provide for most small to medium sized knives is a molded pouch type, horse leather sheath- RH or LH carry, black, natural or classic brown finish. On request can I do some basic tooling, make several different types of sheath, snakeskin inlay, double loop lacing, etc... at an added cost depending on options requested. If any of the above needs clarification, please let me know by going to "contact me" and I will do my best to explain.